Emojify translates any text into emoji! Available on Slack, Facebook, Skype, Microsoft Teams, Kik, Telegram and Twitter. 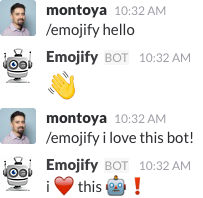 Install Emojify on Slack to enable the /emojify command. Just type /emojify followed by a message (up to 1,000 characters) and Emojify will translate it for you!